2009 polesitter: Martin Truex, Jr.
Hamlin, FedEx Racing Sweep through Texas on Way to Chase Lead: With a NASCAR Sprint Cup Championship very much on the line heading to Texas Motor Speedway, Denny Hamlin and the #11 FedEx Racing team knew exactly what they had to do. By the time the checkered flag waved at Texas on Sunday evening, they successfully crossed flawless execution, winning at Texas for the second time this season, and heading to Phoenix as the points leader off their list. Hamlin started from the 30th spot on the grid for Sunday’s AAA Texas 500 and the #11 FedEx Racing team steadily improved the car through a combination of great communication and smart, quick stops. With the laps counting down, Hamlin rocketed to the front and then held off Matt Kenseth to claim his eighth win of the season to date, his second consecutive win at Texas and a 33-point lead over rival Jimmie Johnson heading to Phoenix this weekend. FedEx Delivery Vehicles Take to the Streets in Support of the FedEx Racing Team: To celebrate the on-track success of the FedEx Racing team, a total of 600 FedEx delivery vehicles in Dallas/Ft. Worth, Phoenix and Miami/Ft. Lauderdale markets will carry a special decal showing the company’s support for the #11 team’s Chase for the Sprint Cup campaign. Hamlin at Phoenix International Raceway: This weekend will mark Hamlin’s eleventh start at Phoenix International Raceway (PIR) and his 186th career start at the Cup level. This spring, only ten days after undergoing reconstructive surgery on his left knee, Hamlin climbed back into the #11 FedEx Toyota at Phoenix determined to put pain to the side in the interest of the team. Despite suffering through the discomfort of the 376 laps around a physical 1.0-mile track, and the agony of losing laps to the leader due to electrical issues, Hamlin never left the seat that he’s occupied full-time since 2006, battling throughout the race to post a 30th place finish in the Subway Fresh Fit 600. A year ago, the #11 FedEx Racing team ran strong on their way to posting a fourth third-place finish at the 1.0-mile track. After a final pit stop on lap 242, Hamlin found himself less that a second behind eventual winner Jimmie Johnson. Hamlin methodically carved into the lead, closing to within .29 seconds with less than 30 laps to run but that was as close as he would get. When Jeff Burton reached his bumper and passed him on lap 284, there was no recourse for Hamlin but to run out the race in third. In the spring of 2009 the #11 team rolled the dice on Saturday night at PIR, using pit road strategy to score an impressive sixth-place finish in the Subway Fresh Fit 500. With ten laps to go and the race under caution, Crew Chief Mike Ford called for two tires only and Hamlin lined up the #11 in fourth place for the restart before finishing sixth. 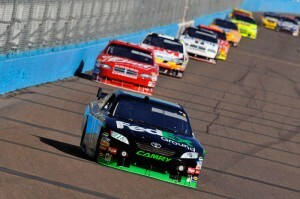 In the fall of 2008, Hamlin continued a string of good runs at PIR by posting a fifth-place finish. In the spring race of 2008, Hamlin and the #11 team looked to have nailed their fuel strategy and ran in third place after their last stop on lap 296 only to watch the cars running in first and second stretch their fuel loads to the end. In the fall 2007 event, Hamlin suffered through an agonizing race that included two pit-road speeding penalties on his way to a 16th-place finish. Earlier that season, Hamlin led 70 laps and was well on his way to challenging for a win before a pit road speeding penalty sent him to the tail end of the field. Despite working his way back, he had to settle for a frustrating third-place finish. Hamlin made his debut at PIR in the fall of 2005 in only his sixth career Cup start and secured his first career pole before finishing 13th on the night. FedEx Ground Plains Along for the Ride in Phoenix: The #11 FedEx Ground Toyota will carry the letters PLNS on the b-post this weekend at Phoenix International Raceway in recognition of the FedEx Ground Plains district’s excellence in package care. The district’s leadership in this area has been the result of a strong quality focus and the development of innovative processes that have been adopted company-wide. The Plains district encompasses all of Kansas and Missouri, including the Lenexa and Kansas City hubs, as well as satellite facilities in eastern Nebraska and Iowa. Phoenix Chassis – JGR 276 and 288: The FedEx team will unload Chassis JGR 276 this weekend in Phoenix. 276 last ran at Richmond in September when Hamlin led 251 laps on his way his sixth win of the season. Chassis 288 will serve in backup duty.